AUTHORS' SYNOPSIS: The extent to which non-functioning or infarcted myocardial segments impose a detrimental load on left ventricular performance is not easily measured and its significance may be underestimated. A method for quantifying contractility in multiple segments of the left ventricle and for assessing the role of the resulting ventricular asynergy was investigated in 15 open-chested pigs with experimental myocardial infarction. High-speed cineradiography of metal clips and cineventriculography showed normal systolic epicardial shortening and transmural wall thickening to an average 15·8% and 31·7% respectively from their end-diastolic values. An unexpected degree of thickening of the left ventricular wall (31·2% of total systolic thickening) was observed in the isovolumic phase. Isoproterenol enhanced contraction mechanics markedly, again mostly during the isovolumic phase. The changes in epicardial segment length and wall thickness completely separated transmural infarction areas from adjacent or remote regions with normal muscle function (P<0·001). Ventricular asynergy occurred, and often reached its maximum extent, in the isovolumic phase. 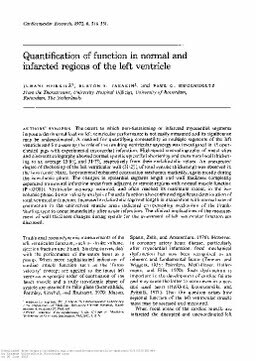 Force-velocity analysis of muscle function also confirmed significant deterioration of total ventricular function. Increased end-diastolic segment length in association with normal rate of contraction in the uninvolved muscle areas indicated compensating mechanism of the Frank-Starling type to occur immediately after acute infarction. The clinical implications of the measurement of wall thickness changes during systole for the assessment of left ventricular function are discussed.